On this episode of DTB’s “Preshow Rituals”, the alternative rock band, Charming Liars, talks about what they do before taking the stage, while on tour with Welshly Arms and The Glorious Sons. On this episode of DTB’s “Bus Invaders”, we take you inside the touring vehicle of the alternative rock band, Charming Liars, while on tour with Welshly Arms and The Glorious Sons. 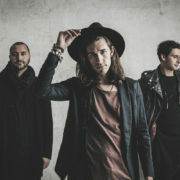 On this episode of DTB’s “Tour Tips (Top 5)”, the alternative rock band, Charming Liars, recommends their tips for being on tour, while on tour with Welshly Arms and The Glorious Sons. In this Preshow Rituals segment, the alternative band, Charming Liars, share what they do before every show.